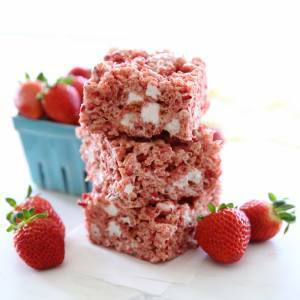 Sweet and gooey and studded with bits of berries, these fruity krispie treats are perfection! Line an 8×8 (or 9×9) pan with parchment, if desired. Place butter in a large pot on the stove top. While it’s melting, place Krispie Cereal in a separate large bowl and add 1 1/2 cups marshmallows. Use your hands to gently crush the freeze-dried berries as you add them to the bowl with the cereal. You don’t need to pulverize them, just crush them into smaller pieces. When butter is melted, add remainder of marshmallow bag and stir until completely melted and smooth. Remove from heat and add almond extract. Use a rubber spatula to scrape out all marshmallow mixture and pour over cereal mixture. Gently stir until cereal is completely coated and transfer mixture into pan. Coat hands with a little butter and then gently press down (DON’T pack it down, gently press!) and let sit until cooled and set. Cut into squares to serve, or ya know- just start pulling chunks out with your hands. I won’t judge.